We first met Martin Cox at one of the early annual Kentucky folk art fair's known as "A Day in the Country." Cox was among the local artists that was encouraged by Garland and Minnie Adkins as well as by the success of other area artists; friends and family. 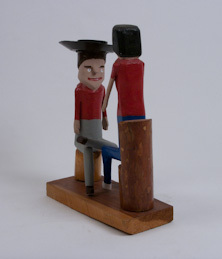 Each to his own, Cox has not only developed a particular wide eyed style but a certain humor that is either intentionally or subconsciously embedded in his painted carvings. Cox's technique is not refined but is consistent, stylistic. His figures have somewhat blockish heads with painted features, including the previously mentioned "wide eyes." His bodies are slender, as if carved from two by four lumber. The arms and hands are carved separately and applied. 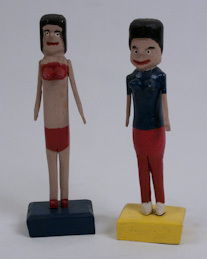 Our collection includes his figural work. Two figures, the man with the white shirt and belted trousers and a woman wearing a red dress became a couple. 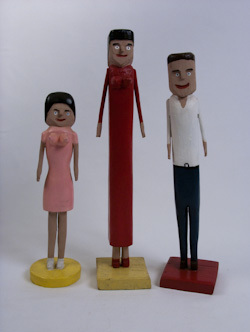 There are three smaller figures which appear more adolescent in proportion and size. 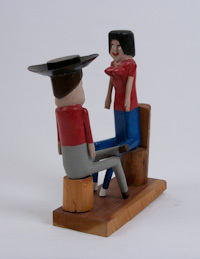 A favorite Martin Cox carving is the pair sitting on the wood stumps. The male figure's gaze is transfixed on his well endowed female companion. He sports a wide brimmed cowboy hat. All of Cox's female figures exude an innocent sexuality with their exaggerated, cartoon-like female forms. Martin Cox continues to exhibit and sell his work. Most recently, he participated in the June, 2010 "A Day in the Country" now held in Morehead, Kentucky at the Morehead Conference Center. His work was featured with over 50 other local and regionally known folk artists.